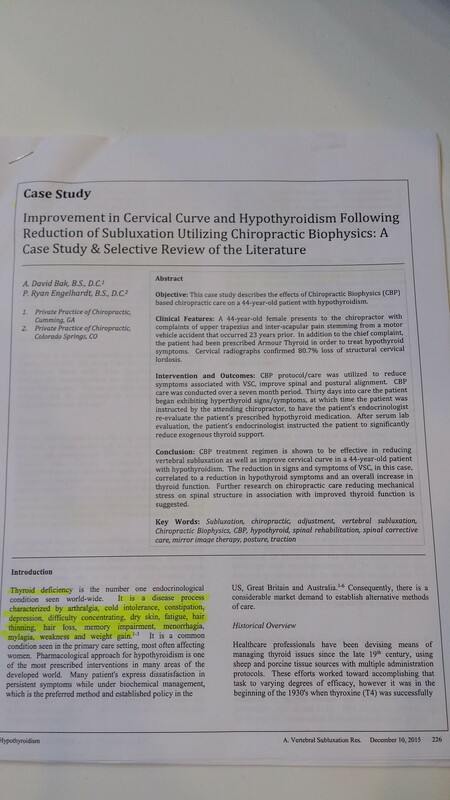 Improvement in Cervical curve and Hypothyroidism following reduction of subluxation utilizing chiropractic biophysics: A case study and Selective review of the literature. This is one of the first studies I have seen regarding chiropractic care impacting a woman’s hypothyroidism. I enjoyed reading it and am excited to share my favourite points with my patients in Mississauga. The chiropractors who reported on this patient’s case did an excellent job reporting the patient’s presenting symptoms, reason for presenting to the Chiropractor, history, exam findings, and outcomes through care specific chiropractic care. I have since read another study regarding Chiropractic care and improvement in a patient’s thyroid function. The summary and link from this 2018 research study is at the end of this blog. Enjoy and stay curious! I encourage you to read the entire research article and I hope that it grows your curiosity as to how a properly aligned spine can impact the body’s ability to adapt and heal! To read more on the topic of thyroid health, check out this blog by our Mississauga Naturopathic Doctor. This 2018 research study highlights the increase in a patient’s thyroid function while under Chiropractic care. The patient was able to reduce their dose of Synthroid used while under regular Chiropractic care. Functional and structural improvements to the patient’s neck, back, and shoulder were improved through the study, which was the original intent of the patient. This is encouraging to people who are having difficulty with their thyroid levels and health. It gives them an action step to improve their health instead of completely relying on a medication. Regular good habits, such as spinal health through Chiropractic, can greatly impact a body!